Splendid Media has been working on a campaign to see Del Boy and Rodney’s iconic three-wheeled van turned into a Lego set. We’ve been helping Shazam Productions – the media production company founded by Only Fools and Horses creator John Sullivan – on its plans for the distinctive three-wheeler to be immortalised by Lego, the world’s most popular toy brand. 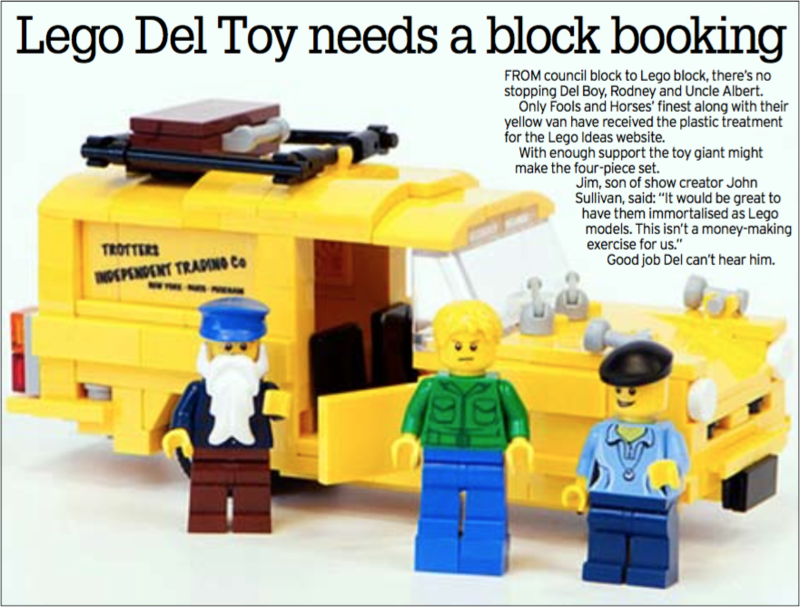 A Lego prototype of the van along with provisional Del, Rodney and Uncle Albert mini-figures has been created by Lego experts Bright Bricks – and it is now live on LEGO® Ideas website and if the project receives the backing of enough people then LEGO® may licence and release it. Coverage of the Trotter van campaign has been achieved on social media, where Facebook posts about it alone have reached almost half a million people and in the Sunday Mirror (left). “It would be fantastic to see the Trotter van available as a LEGO® set so we’re hoping Only Fools fans will get behind the idea and pledge their support,” says Shazam Production’s Jim Sullivan. “Only Fools and Horses is a British institution and Del’s three wheeler is iconic so we think a lot of Only Fools fans of all ages would love the chance of owning one made out of LEGO®,” says Steve Clark, Managing Director of Splendid Media Group. Lego Ideas allows users to submit projects to Lego consideration as products. Successful LEGO® sets which have been developed through Lego ideas include Doctor Who, Ghostbusters, Big Bang Theory and Minecraft.